Registering your animals with Jersey New Zealand has always been an important part of our Association and your business. On average, a registered herd sells $200-$800 above similar herds. Registered cattle give more options for how they can be marketed. Registration is a prerequisite for successful bulls in the genetics industry. Most AB companies require young Jersey bulls to be registered in the Jersey Herd Book. Higher genetics bulls sold as service sires often attract a premium when registered. You can register your animals by contacting us with the relevant registration information or use the online form at the bottom of the page. Click here for more information. We also recommend all members that register to join our Standing Order system. 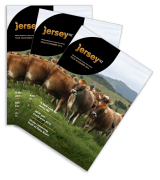 Having a registration standing order with Jersey NZ provides you with an automated and streamlined process for registration seasons; allowing for added flexibility and preference selection for your convenience. The first step involves filling out and returning your standing order form indicating your preferences and in which month you will want the process to be initiated. From then on, annually, we will supply you with a report and letter outlining your registration options. Your registrations will then be completed according to the information reported to you and the inclusion/exclusion of animals according to the feedback received in the office from you. Click here to download your standing order form. To register your Jersey animals you need to be a financial member of Jersey NZ. The standing order process is available to all members who register their Jersey animals. Having a standing order with us provides you with an automated and streamlined process for your registrations, allowing for flexibility and preference selection; prompted by us for your convenience. You select which month you wish your registration process to start. At the beginning of that month you will receive a What If? Report detailing the heifers in your herd that are eligible for registration, and at what status. You are then given one calendar month to name the animals and advise of any additions or exclusions (including Bull calves) to the animals listed (or withdraw for that season). Once you have provided confirmation that naming is complete and of any changes your registrations will be processed accordingly. If nothing is heard from the member, we process at the completion of the one month timeframe. If nothing is heard from you, we process the registrations as per your standing order requirements at the completion of the one month timeframe. Are you a new member looking to get your herd registered? Then consider registering your herd through our Jersey Plus programme. The offer is available to all new members who register their herd before 31 August of the year they join (i.e. for the next Herd Book). Use either the MINDA naming system (see Naming your Animals) or the default naming system and sign up to the annual standing order programme. That is a saving of AT LEAST $7.25 PER ANIMAL on any female animal over one year of age. Call (07) 856 0731 or e-mail Melissa mgoodman@jersey.org.nz in order to find out how to register your Jerseys and other registration options that may work best for your requirements. This offer does not apply to bull registrations, these must be processed individually. Default naming: the automated e-registration programme that provides a default name for your animals during registration, by using your herd prefix (stud name) and the birth identity of the animal. e.g Jersey 16-72. This applies where a name has not been entered. MINDA naming: entering the names you want for your animals on-line using MINDA. For more details on how to name your animals this way call MINDA (0800 264 632). Please notify the office once naming is complete in order to finalise registrations. Manual naming: providing the office with the names of your animals to be entered manually. e.g fax, E-mail, AER form, herd profile, computer listing. These lists must include a list of birth I.Ds and the associated names. Please note that there is an added cost for this service. Names are limited to 25 characters including prefix (stud name), spaces and suffix. You must enter your prefix (stud name) in full, correctly spelt, before the given name. Do not add the suffix (e.g. S1J) to the name; this will be done automatically on registration. Put a gap between your prefix (stud name) and the rest of the name. If you do not (or spell your prefix incorrectly) the programme will default the name as it will not recognise your prefix. Female ET animals will be automatically named with ‘ET’ (included in the 25 character spaces). If an identical name (previously used) is repeated, the default name will be automatically applied and will need to be changed manually via the office. Ensure you type the names out in capitols (if these go through programme in lower case the names will revert back to the default name). If any of the following affects your herd then you need to advise the office before your registrations are processed and we will work through them accordingly.